A book page project is one I’ve wanted to do for a long time but I never had a book I didn’t feel bad about cutting up (and I wasn’t going to go buy one just to cut up.) But this winter my 9 year old picked out this copy of Ramona Forever (Ahhh.. Nostalgia! Did anyone else read Beverly Cleary books as a kid?) at the thrift store and while she was reading it, it began to fall apart. So as soon as she finished it, I snapped it up and started brainstorming. With Valentine’s Day quickly approaching I decided I would do a heart project. 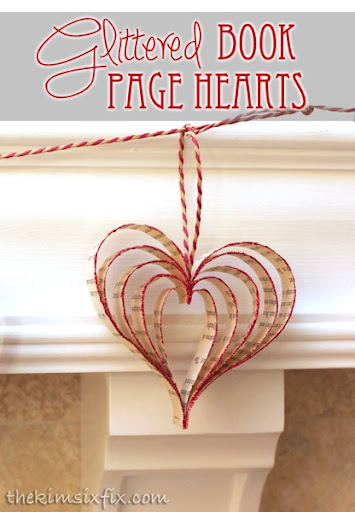 These paper hearts are super easy to make (in fact, my 4 year old helped make a few) and require nothing much more than a paper cutter (or scissors), a stapler, and whatever type of paper you want to use. My book pages were only 7.5 inches long so I thought 1 inch thick strips would be a good thickness. For each heart you need 10 strips, so I just cut two strips out of stacks of 5 pages. Take two 7.5 inch strips and set them aside and then cut 1 inch off the remaining 8 strips. To assemble the hearts you need to stack the strips in ascending order with the shortest strips on the outside. The two longest strips should be in the center of the stack. Line up the ends of all the strips and staple them together. Peel back the loose ends one by one. The shortest strips will form the small center heart and each additional set of strips will create an increasingly larger heart. Once you have all the layers folded back, line up the lose ends and staple to secure them. I wanted to use them in a garland but the plain pages didn’t add enough contrast against my white mantle, so I decided I would glitter the edges. I used a little school glue on a paint brush and lightly brushed the edges of the strips. After I flipped them over I went though with a bamboo skewer and made sure all the layers stayed separate from each other. The glue and glitter made the strips at the bottom of the heart stick together. I only glittered one side, but it would be easy to repeat the process on the other side once they were dry. I used the same baker’s twine along the mantel and hung all my hearts: I’m pretty happy with how my first book page project came out. I can’t wait to use up the rest of Ramona Forever!